The cool waves of the Hawaiian tropics are some of the most beautiful delights our world has to offer. They can be just as inviting as they are intimidating. If you want to get a board out to the open water but you don’t quite know where to start, worry not— the friendly folks at Kona Town Surf Adventures are here to help! As Kona’s premier option for professional surf instruction and rental, we offer surf lessons, board rentals, stand-up paddleboard rentals, private surf tour adventures and more. Our surf school differs from the rest being 100% local and guaranteeing you to feel safe and successful. Kona Town Surf Adventures is staffed by some of the most seasoned surfers in Kona, with combined decades of experience in the water here. Not only does our team understand the ins and outs of surfing, they also know how to predict weather patterns from surf reports and maintain the maximum level of safety for everybody involved on a surfing trip. From group lessons to semi-private lessons to surf tours and more, Kona Town Surf Adventures does it all, providing our own boards and rash guards for your added convenience. Give us a call to set up a lesson, rental or surf tour today! 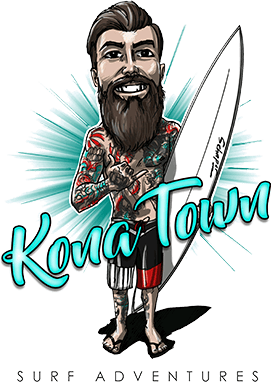 Kona Town Surf Adventures was started by long-time Kona resident Wesley Moore after years of experience surfing waves, diving, fishing, being an operator on a water safety team throughout the Hawaiian islands. As the father of four active children, Wesley wanted a way to give the next generation an awesome introduction to the world of surfing. Since our grand opening in 2016, we have extended our knowledge of surfing to willing students from all walks of life, introducing people to our local way of living and showing off the natural beauty of our home. There’s a reason we maintain a perfect five-star Google Reviews average rating: our instructors have the winning combination of surf smarts, athleticism and kindness to make for a super-fun, easygoing experience for everybody involved. When you sign up for lessons from Kona Town Surf Adventures, you’re signing up for personalized tutelage from some of the area’s finest surfers, all at the industry’s most competitive rates. 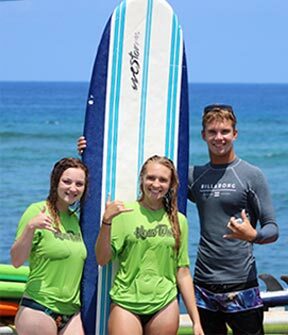 Give us a call today for the best surf instruction and tour services in Kona!